Spaghetti is a lang, thin, cylindrical pasta o Italian an Sicilian origin. 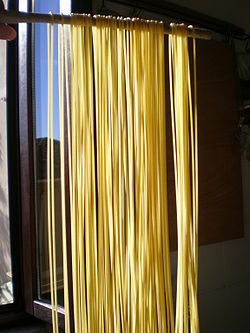 Spaghetti is made o semolina or flour an watter. Italian dried spaghetti is made frae durum wheat semolina, but ootside o Italy an Sicily it mey be made wi ither kinds o flour. Tradeetionally, maist spaghetti wis 50 cm (20 in) long, but shorter lengths gained in popularity durin the latter hauf o the 20t century an nou spaghetti is maist commonly available in 25–30 cm (10–12 in) lengths. A variety o pasta dishes are based on it, frae spaghetti alla Carbonara or garlic an ile tae a spaghetti wi tomato sauce, meat an ither sauces. Spaghetti is the plural fairm o the Italian wird spaghetto, which is a diminutive o spago, meanin "thin string" or "twine". This page wis last eeditit on 21 Mey 2018, at 05:50.